It’s been a whirlwind of a summer… I’ve been enjoying every second of it! Hope you have too…. I just uploaded some live mixes to TheFuture.fm from a 3 hour set I did for SUMMER FLEX ZONE 2 weeks ago.. Listen to Parts 1, 2 & 3 HERE HERE & HERE! 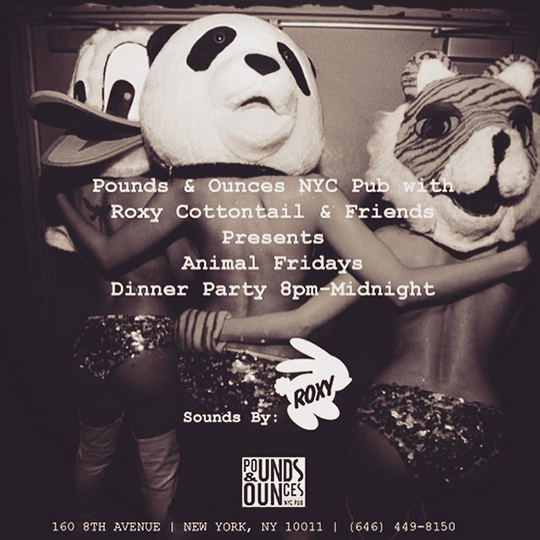 I’ll be kissing babies and shaking hands like Hillary do every Friday at Pounds & Ounces Animal Friday Dinner Party, 8pm- Midnight! Come through for dinner, stay for drinks! FYI – It’s delicious. 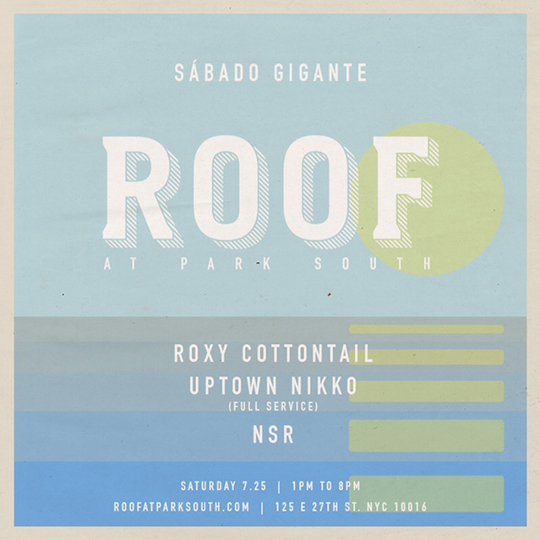 And,,,, I’ll be up in there for Pride Sunday – June 28th. A drag Queen named TASHA SALAD is hosting!! I’ll bring the dressing honey, just expect the unexpected – our flavors together should be very ZESTY to say the least..LOL. I’m looking forward to this one! See you at the function! 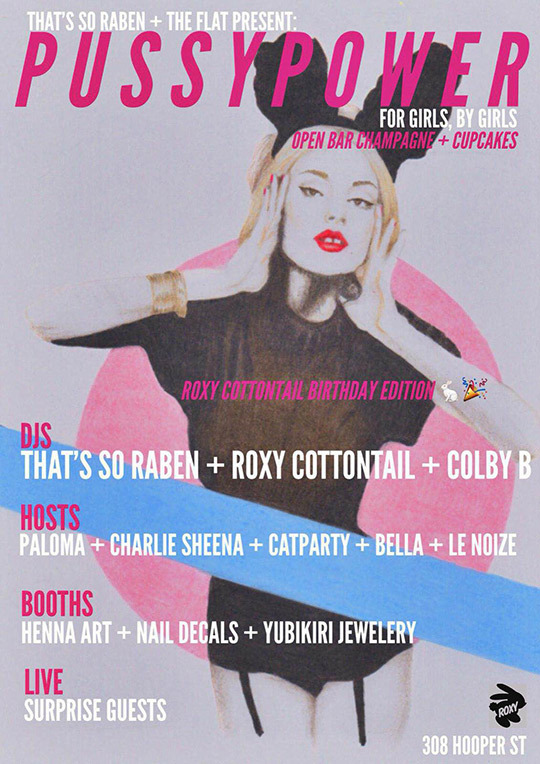 POUNDS & OUNCES PUB WITH ROXY COTTONTAIL & FRIENDS PRESENT.. Flexible Animals of all Varieties NEEDED!! It’s been a fierce minute friends…. The parties haven’t stopped. Every Friday for Summer from 8PM-Midnight I’m DJing a fabulous “Party Animal” themed dinner party at Pounds & Ounces in Chelsea, if you haven’t had their Ahi Tuna Nachos (yes, you read that right) while I’m playing “Cheerleader” sipping a margarita you haven’t really lived. 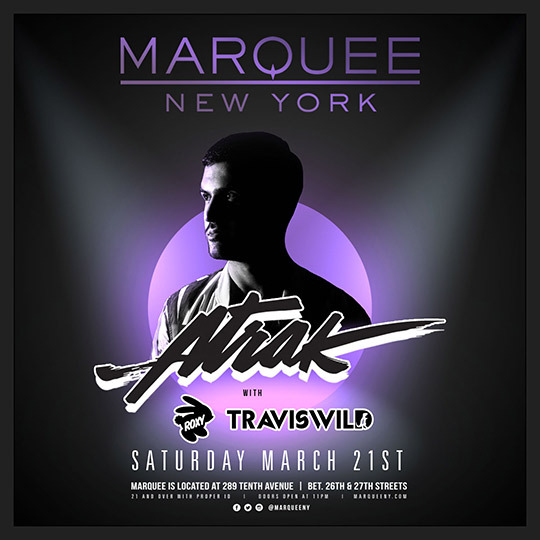 I’ll be there tonight! Come by! Between meals I’ve been on & off working on my fitness model body (Hey Girl Hey!) so that’s been sweaty & pheromoney too. 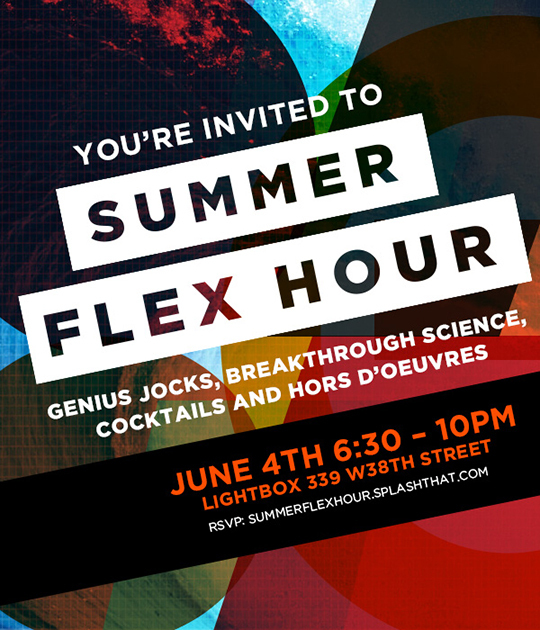 Come catch the vapors next Thursday at Participation Agency’s “SUMMER FLEX HOUR” while I DJ the “Tasting” (slick words for party with music & alcohol) of an unnamed workout drink made to treat muscle soreness. Yes, you read that right too. This summer is off to a great start!! See you somewhere soon!! The PA is producing an exclusive, pre launch tasting of an athletic beverage on June 4th from 6:30-10p at Lightbox Studios on W 38th. Flex Pharma, Inc. was founded when an MIT prof and Nobel Prize winning scientist invented the (currently unnamed) drink, the first proven to prevent and treat muscle cramps in high performance athletes. Naturally we’re throwing a party to tell the brand’s story. 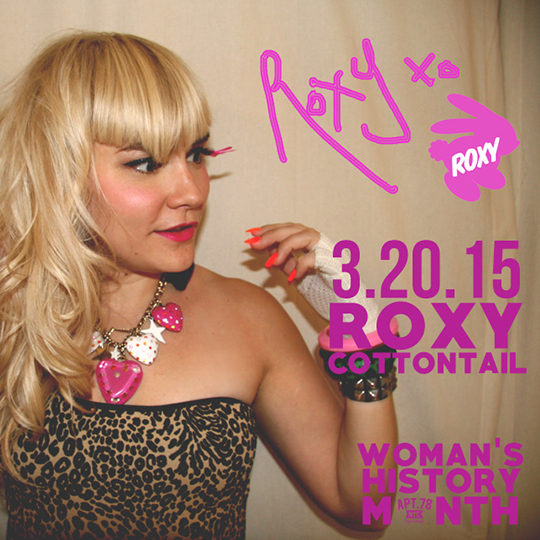 Come immerse yourself in a 360 degree digital installation and dance to the beats of DJ Roxy Cottontail. There will be cocktails featuring the product, ensuring no sore muscles the next day. Got a Birthday. Got my Marilyn. Got a memorial. Got some parties (FREE). With FREE Cupcakes & FREE Champagne. Might be having the time of my life! Join me! Cuz my dream teams are throwing me some exclusives!!! We celebrate our dear friend Graham Oliver‘s life (RIP) tonight at SANTOS PARTY HOUSE, I’ll be spinning early with an outlandish line up. Details below.. I met Graham during the Rawkus Records days with the Squirrel Gang (which gives you an idea of how old I’m going to be). Graham was one of the greatest dudes, the kindest & most supportive people in my early days of running parties downtown. 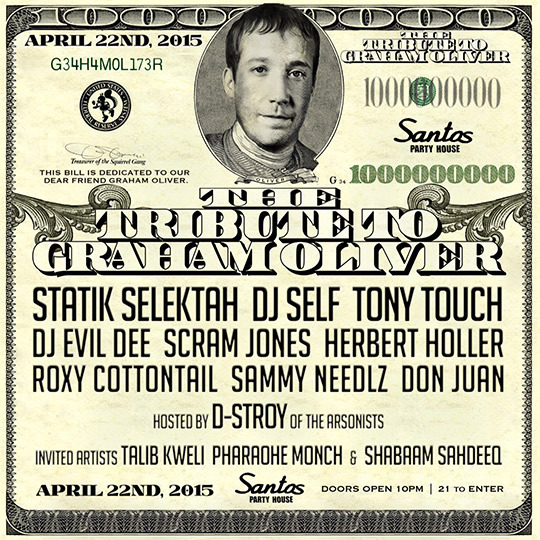 He will truly be missed by so many… RIP Money Gram…Can’t wait to honor you with all our friends tonight! Oh and…… Our Sunday Brunch is back. We have a new home with more brunch for your buck! Stay tunes for details!!! It’s BIG!!! 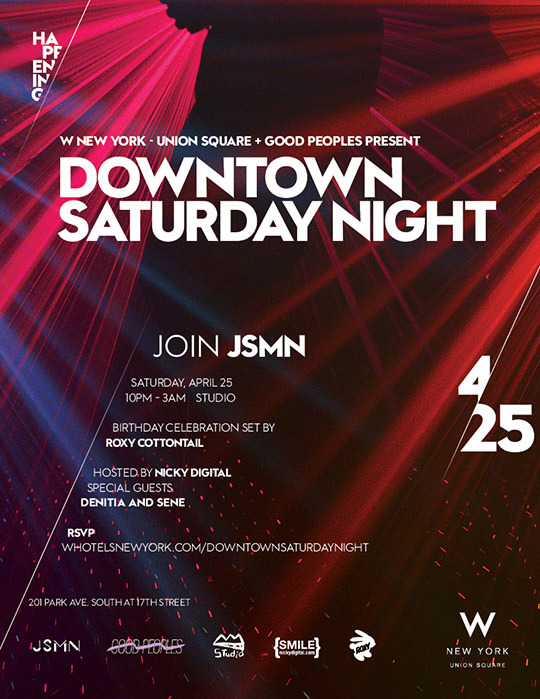 W NEW YORK Union Square & GOOD PEOPLES Present..
201 Park Ave South @ 17th St.